Frozen shoulder is the more commonly used term for a shoulder joint condition called adhesive capsulitis. Frozen shoulder occurs when the tissues around the shoulder joint thicken and tighten. Over time scar tissue can develop, limiting the space around the shoulder joint and progressively inhibiting movement. More common in women than men, frozen shoulder is a typically found in people between 40 and 60 years of age. Symptoms include swelling, pain, and stiffness - usually in one shoulder. Usually, the condition takes two to nine months to develop. Frozen shoulder is a progressive condition that often starts with pain in the shoulder joint during basic movement. The condition progresses first with increased pain followed by decreasing mobility. 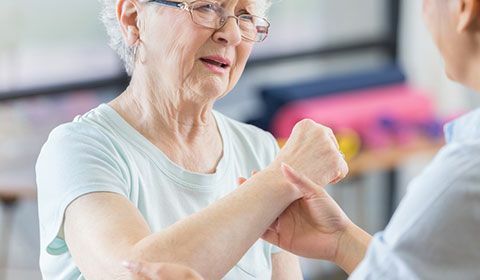 Anyone experiencing pain and or stiffness in one or both shoulders should see their healthcare provider, particularly if the pain persists for more than seven days or stiffness progresses. The freezing phase of frozen shoulder starts with a gradual increase in joint pain. Pain will likely spread around the shoulder and become worse at night, making lying on the affected side uncomfortable. In the frozen phase, shoulder pain will persist and stiffness will be noticed. Normal day-to-day tasks such as lifting medium weight objects or complex movements will become more difficult. Shoulder muscle deterioration is a risk in the frozen phase, as the shoulder is used less and less to avoid pain. If treatment is effective and inflammation is reduced, then the condition will enter the thawing phase. Range of motion will slowly be restored and pain will gradually decrease, although it may re-appear occasionally as mobility returns. 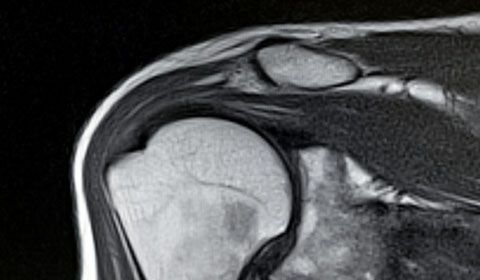 Although the root cause of frozen shoulder is unknown, it is believed to occur when the lining of the shoulder joint (the capsule) becomes inflamed, causing scar tissue to form around the joint. This leaves less room for the humerus bone to move, and it will slowly stiffen as inflammation and scar tissue increases. Primary frozen shoulder can often occur in diabetics, people with a hormonal imbalance, a weakened immune system or prone to joint inflammation. Frozen shoulder may be more common among people with diabetes (particularly insulin-dependent diabetics) due to glucose molecules sticking to the collagen fibers in the joint capsule. Diabetics are also more likely to have both shoulders affected. Hormonal changes may be responsible for the higher occurrence of frozen shoulder among women than men, particularly for women who are menopausal. Secondary frozen shoulder can also occur after a prolonged period of upper body inactivity, due to an injury, illness, or surgery. There are some indications that poor posture, in particular rounded shoulders, may cause the shortening of one of the ligaments of the shoulder, which can also contribute to developing this condition. What are the risk factors for frozen shoulder? Although frozen shoulder can happen to almost anyone, it is most common in adults between the ages of 40 and 60, and women in particular. To diagnose someone reporting shoulder pain and other potential symptoms of frozen shoulder, the doctor will ask the patient to perform specific movements and will measure the range of motion in the shoulder joint. The doctor will move the patient’s arm to determine the “passive range of motion” - which is the range of movement available in a joint when someone else is moving it, and compare it against the patient’s ability to move the joint themselves - the “active range of motion”. If the range is similarly limited in both cases, then it is likely frozen shoulder. If motion is limited only in the active range, the symptoms could be the result of other conditions, such as muscle strain or tendonitis.. The doctor may also conduct a MRI scan to identify and eliminate other potential causes, such as a torn rotator cuff or other joint/shoulder conditions. An x-ray may be necessary to identify other potential underlying conditions, like arthritis. As joint tissue is soft, the x-ray may need an arthrogram, which involves injecting dye into the shoulder to improve visibility. Are there any activities that worsen symptoms? Have you previously injured the shoulder? And if so, how? The most common, and often most successful treatment for frozen shoulder is physiotherapy. A trained physiotherapist will focus on stretching the shoulder joint to improve mobility and relieve pressure on the joint. Therapy can take anywhere from a few weeks to nine months depending on age, severity and other contributing conditions. A physiotherapist may also recommend self-directed gentle range of motion exercises that can be performed at home. 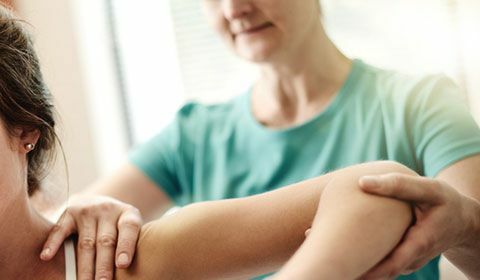 If severe pain and/or stiffness is inhibiting quality of life and physiotherapy alone is not alleviating the condition, there are a number of medications that can help relieve the symptoms of frozen shoulder. Prescriptions can be as mild as anti-inflammatory medication such as aspirin, ibuprofen, or naproxen sodium, through to more significant treatments such as steroid injections directly into the shoulder joint. If physiotherapy does not improve the frozen shoulder symptoms, a doctor may recommend surgery. Surgery can range in complexity and invasiveness depending on the severity of scar tissue buildup. 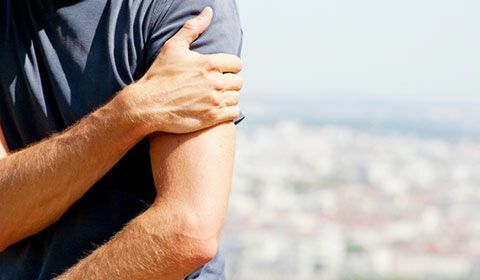 In cases where the buildup is mild but painful, a surgeon can simply manipulate the shoulder through a full range of motion under a general anesthetic to help break up any adhesions. In cases where there is significant scar tissue buildup, a surgeon may conduct arthroscopic surgery, which involves making a small cut in the shoulder and using a camera to remove scar tissue manually. Most forms of frozen shoulder surgery are performed on an outpatient basis. Post-operative physiotherapy is typically still required. Most patients will have their full range of motion back within three months.